Home from the seminary for the summer, 19-year-old Harold Ripperger sat in his parents’ house and listened as the Major League Baseball scout made him the most tempting offer he had ever heard. The scout told Ripperger that he had seen him play baseball in Richmond that summer, and the Detroit Tigers officials were interested in talking to him about becoming a professional baseball player. The more the man talked, the more the idea appealed to Ripperger. He could play the sport he loved, maybe get married and have children, and even possibly get rich pursuing one of his childhood dreams. Yet there was also this other childhood dream that he had to consider. Ever since he was in the seventh grade, Ripperger had thought about becoming a priest. In fact, he had been attending Saint Meinrad’s high school seminary in St. Meinrad since he graduated from the eighth grade. The year was 1951, a time when Ripperger prayed and prayed for God’s guidance. Finally, he decided to continue his journey to become a priest. And seven years later, in 1958, he was ordained to the priesthood. 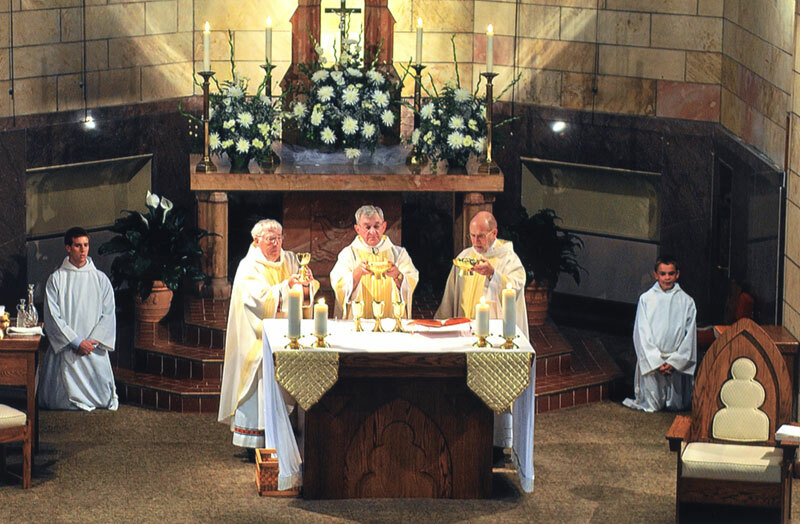 Now 76, Father Ripperger is celebrating his 50th year as a priest. For the past 19 years, he has served as the pastor of St. Mary Parish in Lanesville in the New Albany Deanery. 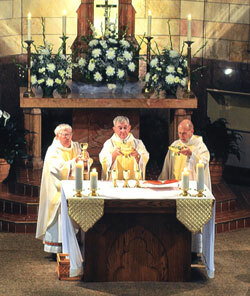 He has also served the archdiocese in the parishes of St. Mary in Greensburg, St. Mary in New Albany, St. Joseph in St. Leon, Holy Guardian Angels in Cedar Grove, St. Rose of Lima in Franklin, St. Mary of the Immaculate Conception in Aurora, and St. Andrew the Apostle and St. Michael the Archangel, both in Indianapolis. Friends from some of those parishes joined Father Ripperger in May as St. Mary Parish in Lanesville honored him at a dinner. One of the tributes that evening came from Chuck Lynch, the president of the St. Mary Parish Council. Lynch became emotional as he talked about Father Ripperger. Father Ripperger said he learned that approach as a boy from watching the priests as he attended St. Andrew School in Richmond. He was also influenced by his older brother, Father William Ripperger, who is retired. And he fondly remembers the late Father Robert Borchertmeyer, a friend from his childhood who lived next door in Richmond and shared his love for baseball, God and the priesthood. Father Ripperger answered that call. He’s also thanked God for his friendships with his fellow priests and his ability to share the sacraments with people. Joy fills his voice when he talks about bringing people closer to God through first Communion, ­confirmation and marriage. Father Ripperger has found his own joy in the choice he made long ago. Education: Seminary at Saint Meinrad School of Theology. Bachelor of Arts degree in history at Saint Meinrad.